Nate baptizes his friend, Brendan, in Lake Erie, while Alex McCue looks on. Nate Schneider and Brendan Mercier were two normal 8th grade kids who ran track at Buckeye Valley Middle School in the spring of 2012. They were friends, great friends. Nate knew Jesus and was active in the youth ministry at Delaware, Ohio, Grace Brethren Church (DGBC). Brendan did not know Jesus. One of their track coaches was Alex McCue, the pastor of middle school ministry at DGBC. Alex talked with Brendan throughout the spring, and so did Nate. At the beginning of their freshmen year at Buckeye Valley High School, Nate invited Brendan to DGBC High School Lakeside Retreat over Labor Day Weekend. This was the first event Brendan attended at DGBC. Throughout the course of the retreat, Brendan again heard the gospel of Jesus shared. Nate pulled Brendan aside for a conversation about Jesus, and where Brendan’s heart was. Brendan came away from the retreat understanding the gospel. Brendan came to church and youth group at DGBC throughout his freshmen year of high school. However, it was not until the end of his freshman year, at the DGBC summer camp Operation Everything, that he gave his life to Jesus. 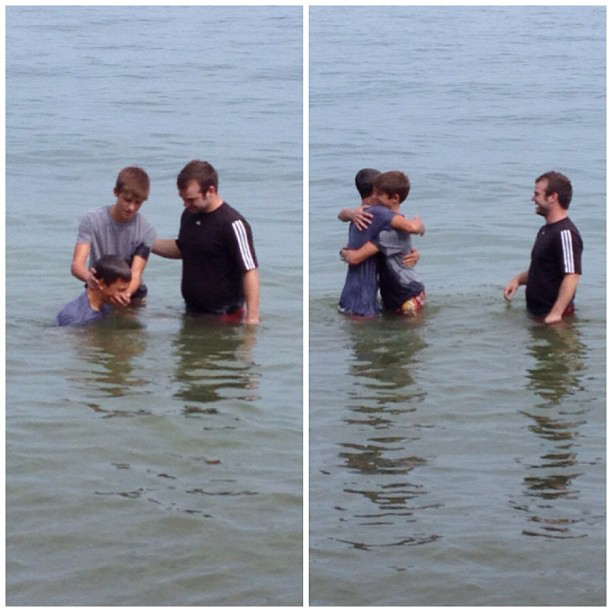 This past Labor Day Weekend, one year after Brendan first understood the gospel of Jesus, Brendan was baptized by Nate in Lake Erie at the Lakeside Retreat. It was joyful day to watch the fruit of a student named Nate who took Jesus’ directive from Matthew 28 seriously, to make disciples and baptize them. As an aside, two other students, Austin and McKenzie, gave their lives to Jesus Christ at the Lakeside Retreat this year. It happened on the same day that Nate baptized Brendan. Heaven had a huge celebration that day! Brendan is following Jesus faithfully now. He is even intentionally investing in some of the middle school students in our youth group. This is a story we long to see repeated, and definitely one we rejoice in. What is your story of intentional friendship? Have you seen a friend become a Christ-follower because of your influence? Was Christ first share with you by a friend? Share your story in the comments section below.